Tai chi literally means "Supreme Ultimate" and encompasses the belief that everything in the universe depends on the interaction between the polar opposites of Yin and Yang. Where Yin is represented by night, negative, soft, earth, intellectual and Yang by day, positive, hard, sky, physical. Chuan can be translated as "fist" or "boxing" and represents the martial or fighting art. 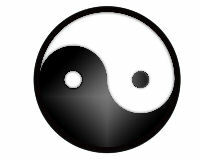 Add the two together and you have t'ai ch'i ch'uan  a martial art ( its also spelled as taijiquan - we've used all 3 spellings here so you can get used to them) using Yin and Yang to counteract each other. For example, hard blocking moves are countered with soft evasive ones. Taijiquan uses a number of different techniques including low kicks, Push Hands and striking to improve breathing, co-ordination, footwork, balance and flexibility. Spears, swords, sticks and sabres can also be used as part of specialised ta'i ch'i ch'uan. And before you ask, we've only tried one - a tai chi sword form and so far we've managed to wreck one lampshade - these swords are longer than you think!. Weapons forms are very popular and demand high skill levels to perform them well. Men and woman can be equally skilful because the skill is not dependent on size or speed but on internal awareness and power. 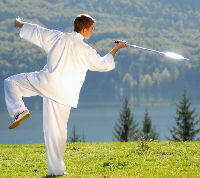 Acquiring and developing enough skill to be able to use taijiquan in self defence requires dedication and persistence. And cannot be done without a good teacher its not something that you can really learn from a book or dvd -although both can be useful to refresh your memory and think about the techniques that you have been taught.